The agriculture industry has a never-ending concern of meeting the requirements of rapid growing population across the world. Thus, the industry is seeking new opportunities by adopting modern technologies not just in crop production tools & techniques; however, farmers are all set to leverage the capabilities of big data for more effective results. Data analysis enable the farmers to better forecast the climatic conditions and hence to make the optimum utilization of the available resources. Moreover, concerns such as the harmful impact of chemical fertilizers on the environment have compelled the agriculture industry to focus on organic farming. Our agriculture industry portfolio is aimed to cater the opportunities and challenges in the industry and their impact on the future market growth. Our agriculture portfolio will cover reports related to agriculture equipment, chemicals & fertilizers, livestock farming, Organic Crops, and so on. Some of our top selling market reports in agriculture domain are Global Gardening Equipment Market, Global Connected Agriculture Market, Global Sulfur Fertilizers Market, Global Agricultural Sprayers Market, Global Agricultural Micronutrients Market and others. 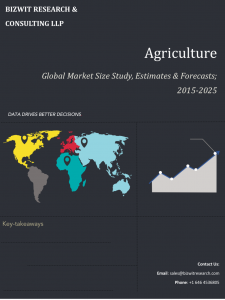 Agriculture Drones Market Size Study, by Component (Hardware, Software, Services) by Type (Fixed wing, Rotary blade, hybrid) by an application (Crop Scouting, Variable Rate Application, Field Mapping, Livestock Management, Others) by Regional Forecasts, 2017-2025.